With another Martin Luther King Jr. Day behind us, the Thacher community has begun to reflect on this biennial (soon to be yearly) tradition of trading classes for workshops and textbooks for discussions in the spirit of Dr. King’s penchant for activism and awareness. Jamal Joseph of Columbia University’s School of the Arts kicked off this year’s two day event. On the evening of January 18th, he spoke to students about his role as a member of the Black Panther Party, specifically the Panther 21 and his ensuing years as a director, poet, activist, and writer—penning the 2012 memoir Panther Baby in light of the Party and his 20-year prison sentence. The following morning, students assembled in the Milligan Center for a viewing of Dr. King’s ‘I Have A Dream’ Speech, renditions of Bob Marley’s 1979 hit “Redemption Song” and Sam Cooke’s “A Change Is Gonna Come,” followed by a reading of Langston Hughes’ “Let America Be America Again” and finally a discussion headed by Professor Joseph and Whitney Traylor (father of Kami Sims-Traylor ‘15). Students then headed off to workshops with names such as “Deconstructing ‘White Privilege’” and spanning topics from civil rights musicians to “voluntourism” (service trips abroad). One topic noticeably absent from the list this year, however, is one that also remains a sensitive and hushed issue in the Thacher community despite efforts from the administration, students, and faculty to induce discussion. It also parallels the inherent conflict of the civil rights movement, with Joseph calling it “a class struggle, not a race struggle” during his Sunday evening symposium. Thacher’s relationship with wealth disparity is one that has followed the school since its inception. As with any independent boarding school, finding a healthy balance between full-paying kids and those extended aid can be a fine line to walk for the admissions office. While the school boasts a $130 million endowment and allocates $2.5 million yearly for financial aid, sourcing this money can be a tough choice between tuition and endowment. Kim Bastian, Director of Financial Aid, believes finding the right ratio between students on financial aid and full-pay students is difficult. This reality has stressed the breadth of Thacher’s financial aid services and kept the percentage of students on financial aid at 27%, a full 9% lower than the national average. This percentage has also exhibited a downward trend in recent years, falling five percentage points from the 2009-2010 to 2012-2013 school years. Members of the admissions office point to the rising size of grants for such a decrease. The average grant is currently $38,800: a full $18,000 higher than the boarding school average. This ratio of low disbursement to high aid allows the school to remain sustainable and ensure that need is met for current families year-to-year. This commitment to aid has also greatly grown in the last ten years, with the GTR (gross tuition revenue) dedicated increasing from 14 to 20%, largely in part to the last capital campaign. Fundraising will be a major component in elevating this number to 26%—the average of Thacher’s “competitor” schools. While financial aid has remained an integral part of the school’s legacy (An “Affording A Thacher Education” tab appears with a once-over of the school website) and has been used as a tool for attracting diverse students, it appears the social stigma attached to aid prevents this diversity from really taking effect. Even teachers, some of the most socioeconomically diverse individuals of the community, feel an obligation to keep discussion of money out of the picture in their relationships with students. Interestingly, out of 42 Thacher teachers polled in a recent survey, 35% expressed that they had been raised in a lower-middle class family ($32,500-$60,000 per year for a family of four) with another 35% hailing from middle-class families ($60,000-$100,000 per year for a family of four). Few teachers (only approximately 7%) claimed to be from homes averaging over $250,000. Thacher’s lack of discussion may not be blatant disregard, but an intentional choice on the part of teachers who felt their socioeconomic statuses inhibited their social relationships and performance in high school or college. Science teacher Ms. Heather Grant recounted her experience in college, specifically when it came to the dilemma of ordering takeout. Ms. Grant, who was raised in a lower socioeconomic background, felt a sense of disconnect in dealing with friends from privileged families who could order food without worrying about the cost. For the student-athlete who was on scholarship, this created a sort of undiscussed tension within her social group—something Ms. Grant says still affects her interactions with her current students today. Additionally, with close to 60% of these faculty attending public high schools, funding and resources afforded to Thacher by its large endowment (which supports programs such as the Martin Luther King Jr. Symposium itself, or the Anacapa Scholars program) may not have been available to encourage such open environments of discussion for Thacher’s teachers when they were in high school. Kim Bastian believes that there may be other factors influencing the desire not to speak on this subject. 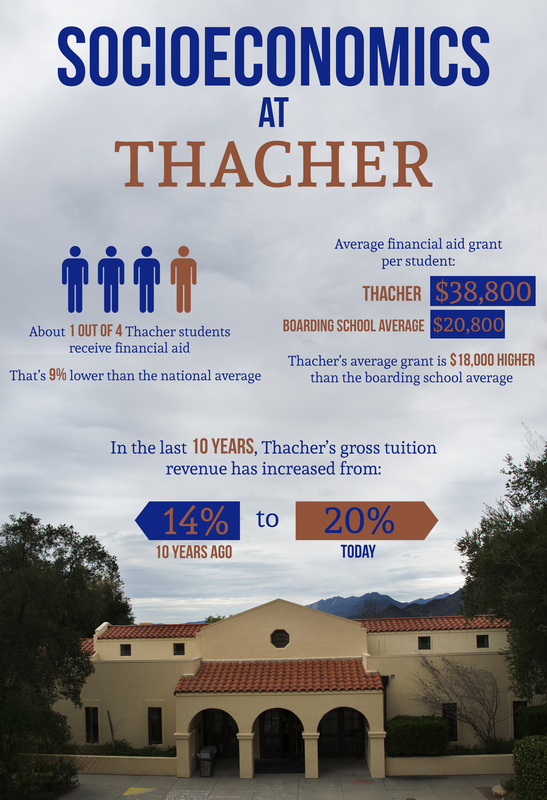 Efforts to keep financial aid not only a stable but growing element of the Thacher community have increased in recent years, particularly in regard to the Strategic Plans, which have rallied strong support for scholarship and aid programs amongst parents and alumni. The 1999 Strategic Plan, though lacking explicit mention of financial aid improvement, called for significant changes. This initiative has been most recently realized with the Strategic Plan 2017, which was first mentioned in the feature “The Road to the Future” in Thacher’s Spring 2012 Magazine. Variations of the plan have included a 2.0 and 2.1—numbers which the administration predicts will rise as more addendums are made. The plan, written by the school’s senior administrative team and approved by the board last year, includes an ambitious call for socioeconomic diversity. With a final benchmark set at $16 million, the administration hopes this money will provide many more students with an opportunity otherwise not afforded to them. To prepare for this future and maintain the level of diversity Thacher has now, many students are calling for the administration to give socioeconomic diversity a bigger stage. Grace Callander ‘16 expressed her hope for this change. In order to prepare students to deal with the world outside the Thacher “bubble,” stigmas of financial need must first be stripped. Full-paying students may initially feel uncomfortable in a position of privilege and alternatively, students on financial aid may worry about how they are perceived. Ms. Bastian emphasizes that aid is not synonymous with charity. Ms. Bastian also added that people should avoid assumptions before having discussions. While most kids had great praise for the MLK Day festivities, others felt that it was only an attempt to resolve a lack of discussion during the other 178 days of the school year on topics such as race and class. Brooke Porter ‘16 believed these forums for discussion provided hope that Thacher could become more open. For others, the inundation of information regarding civil rights and the current reality of America’s wealth disparity only further highlighted the absence of such discussion within the context of Thacher’s tight-knit community. Elliot Schiff ‘16 believes the lack of diversity at Thacher can be attributed to several issues. Students have made it clear that they want change. If the new civil rights movement that Jamal Joseph discussed is to continue the legacy of the first, of “moving forward” in the words of Dr. King, then Thacher must prioritize discussion about wealth and socioeconomic class—broadening horizons for current and future students alike.